In less than 24 hours, inmates late Thursday morning again attempted to burn the Georgetown Prison for a fourth time. At about 11:15 AM, thick clouds of smoke could be seen billowing from the penitentiary which houses both remanded and convicted prisoners. Reliable sources on the scene said they heard a loud explosion and moments after saw thick smoke from the wooden and concrete jail. Police and prison service personnel have been deployed around the facility and vehicular traffic has been diverted away from the block that includes Camp, D’Urban, Bent and John Streets. This latest effort followed a similar occurrence Wednesday night that kept fire fighters, police, soldiers and prison service personnel busy. Then, the inmates repeatedly lit mattresses as soon as the blaze was extinguished. 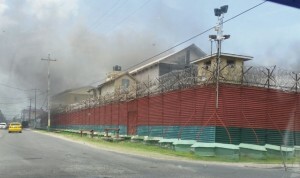 The past twelve hours has seen a sort of unrest and rebellion on the part of inmates at the Georgetown ‘Camp Street’ Prison and prisoners have once more set fire to a mattress in one of the cells. This would make the fourth time in the past twelve hours that fire fighters have had to quell mattress blazes at the Prison. Late last Wednesday evening, firefighters rushed to the prison after prison officers observed flames coming through one of the windows of the building. After putting out that small blaze, the prisoners managed to light the fire twice more before giving up for the night. Public Security Minister Khemraj Ramjattan told Demerara Waves on Thursday that initial reports reaching him indicate that the prisoners were engaged in some form of rebellion. He told Demerara Waves that during a contraband raid on Wednesday, cellular phones, and marijuana were taken from the prisoners. This, he explained, coupled with other factors spawned the rage of the prisoners. The other factors mentioned by the Minister include the fact that the prisoners have to wait lengthy periods for trials and the overcrowding of the facilities. The Camp Street Prison was built to accommodate 775 inmates, but it now houses more than 900 inmates, according to 2011 data. Officials have confirmed that the amount of persons now housed at the facility surpasses 1000. Ramjattan said that attention would be placed on ensuring that the new facility at the prison is completed so as to give prisoners some more room.